There are two contradictory messages at work in the family movie Chillar Party. The explicit message directed at kids is that friendship, loyalty and compassion are values worth fighting for. The implicit message conveyed by the grown-up characters is that those values are meaningless in adulthood. 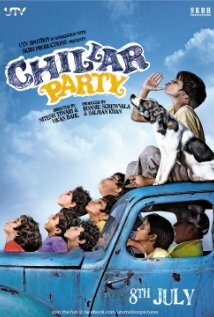 The movie focuses on a group of eight elementary school boys who call themselves Chillar Party. A homeless orphan named Fatka (Irfan Khan) takes up residence in an abandoned car on the grounds of their apartment complex, where he makes money washing the cars of the middle-class apartment-dwellers. Chillar Party sets about terrorizing Fatka, fearing that his canine best friend, Buddy, will defecate on their cricket pitch. The cruel acts culminate in the boys locking Buddy in a car with the windows rolled up, reducing Fatka to panicky tears. It’s such a tense scene that it’s hard to watch. The boys realize they’ve gone to far and let Fatka and Buddy join Chillar Party. Their friendship is put to the test when Buddy defends Fatka against rough treatment at the hands of a politician’s aide. This prompts the politician to call for a city-wide eradication of stray dogs, starting with Buddy. Chillar Party bands together to fight for Buddy’s life on behalf of Fatka. Through a narrow lens, Chillar Party is a pretty good movie for kids. The young actors are competent, and all are cute (as is Buddy the dog). There are some laugh-out-loud funny moments when the kids spout dialog wiser than their years, and the moral themes of self-sufficiency and loyalty are well-presented. However, the cast is too big to allow any of the kids to develop distinct personalities beyond their nicknames. Throw in the kids’ parents and other apartment residents, and there are a few dozen characters to keep track of. On top of that, the film has a runtime of 135 minutes, way longer than the youthful target audience can be expected to pay attention. But Chillar Party‘s biggest problem concerns the behavior of the adults in the apartment complex. First is their troubling acceptance of child labor, a practice which the politician eventually points out is illegal. No one bats an eye when the president of the apartment board hires a kid who’s at most ten years old to wash their cars. For the sake of the plot, I’ll let it slide. Yet none of the parents is willing to make even the slightest compassionate gesture toward Fatka, beyond paying him for services rendered. All of the families have enough money to afford cars and remote-controlled toys for their own kids, yet none of the mothers ever sends her child out with a plate of leftovers for Fatka. No father offers to let the boy sleep on the couch when rain pours into the car he calls home through windows that won’t close. In fact, when one family notices Fatka shivering feverishly, the father’s response is to turn his own son’s face from Fatka’s suffering and usher the family into their apartment. Fatka spends the night in the car, hungry, sick and alone. By this point in Chillar Party, Fatka is a friend to all of the boys in the apartment complex. The kids make an effort to help him in the best ways they can think of, given their nascent senses of morality. The fact that the parents are willing to risk the potential, preventable death of their children’s friend — just because he’s not their own kid and, therefore, not their problem — is appalling. This entry was posted in Reviews and tagged 2 Stars, 2011, Bollywood, Chillar Party, Hindi, Indian, Irfan Khan, Movie Review, Runtime on November 19, 2011 by Kathy. Great review! Just caught this film on the plane to India and definitely enjoyed the painted parallel universe between kids vs. adults. Makes me realize we have a lot to learn from children. Being in India, it becomes even more apparent.